Over the past few decades, the national industry has seen the number of farms decrease with a simultaneous increase in the average farm size. With larger farms and continuously improving farming techniques, the need to increase production and efficiency has affected equipment carrying capacity and completely changed the tools being used. During select seasons, it is common to have single-axle loads on secondary roads and bridges that exceed normal load limits (typical examples are grain carts and manure wagons). Even though these load levels occur only during a short period of time of the year (fall for grain carts and spring for manure wagons), there is concern that they can do significant damage to pavements and bridges. Currently, the only limitation placed upon farm implements is a metric based upon the load per unit width of tire. This metric does not appear to be consistent with the metrics commonly used during design of infrastructure. The objective of the work presented in this report was to perform a synthesis study related to the impacts of heavy agriculture vehicles on Minnesota pavements and bridges and to identify those impacts. The synthesis and associated analyses were completed using metrics that are consistent with engineering design and evaluation concepts. The conclusion of this study validates the years of close observation of highway and bridge engineers that the heavy agricultural loads can cause potential problems in terms of both safety to the traveling public and added costs to the maintenance of the local system of highway infrastructure. 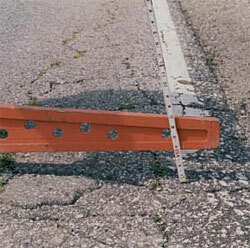 Close-up view of pavement damage resulting from edge loading.